This is the fifteenth in a series of “Battlestar Galactica” recaps. This year marks the 15th anniversary of the franchise. 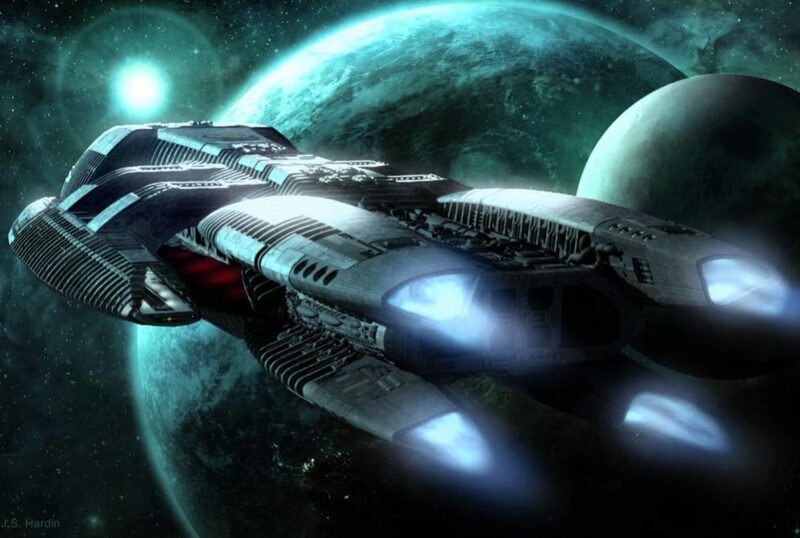 Read the last piece, “Revisiting Battlestar Galactica: ‘Resurrection Ship’ (Parts 1 And 2)” here. Perhaps it was inevitable that the tightly-scripted Pegasus storyline would be followed by two of the weaker episodes of the series. In “Epiphanies,” the writers save Pres. Roslin. It’s easy to understand why: the show would be fundamentally different without her. But it is a sign the writers lacked the long-range vision the mini-series and Season One suggested. “Black Market” is even weaker. The writers did not think through the economics upon which the plot is based; the introduction of child trafficking feels like a ham-fisted way of addressing the underlying script problems. Nevertheless, the series is driven by its characters and we learn more about Roslin and Apollo via flashbacks. We also learn the cerebral Baltar is often reactive and emotional. He is driven by fear of the power he craves, as well as anger at Roslin’s opinion of him. Roslin is rushed to the sick bay, entering the final stages of her cancer. She flashes back to the day she was diagnosed. After receiving the news, she dips her foot in a fountain in a Caprica City plaza. She also recalls something inconsequential to her at the time: Baltar kissing Six in this plaza. Most of the episode, however, is catching up in a more recent flashback. Roslin meets with Cdr. Adama and Baltar to discuss Dr. Cottle’s discovery of abnormalities in the blood of Boomer’s unborn child by Helo. Although circumstances make Roslin more pro-life about humans, she orders the termination of Boomer’s pregnancy for security reasons. Baltar (who believes the child is figuratively his) unsuccessfully lobbies Adama to push back against Roslin. Baltar’s mental Six warns he may need the nuclear warhead he obtained from Adama as leverage to save their child. Adama delivers the bad news to Helo. Meanwhile, the crew discovers the Vipers’ ammunition has been sabotaged. Adama orders Apollo to investigate. Apollo and Starbuck find the saboteur in the fleet’s ammo facility; she is a member of a pacifist group named Demand Peace. Adama agrees to meet with Jahee (Paul Perri), a Demand Peace representative, then jails him. This contrasts with Roslin’s flashback to her decision to negotiate with a striking teacher’s union, despite incidents of violence. Searching the saboteur’s possessions, Apollo learns the fleet’s Tylium fuel refinery is another target. The refinery dock explodes before his Raptor reaches it. Baltar, as Vice-President, receives a briefing from Billy in anticipation of Roslin’s death. Baltar feels the weight of his looming responsibilities and pockets the letter Roslin has written him (echoing a tradition of American presidents). The briefing is interrupted by a call for Baltar to visit Cloud Nine. He meets with the fugitive Six, who has become a Demand Peace leader. He tries to kiss her, but she knocks him down, saying she’s not ready for that after her abuse on Pegasus. She proposes that he turn on Adama; he replies he will not be responsible for destroying humanity. Roslin’s flashback further reveals she was in a relationship with Pres. Adar, who is upset she brokered a deal with the teachers’ union, feeling it sets a bad precedent. He seeks her resignation; she refuses, telling him to prepare for a fight when she returns from the decommissioning of Galactica. Helo gives Boomer the news about their child. She attacks the guards, but is sedated and taken to the sick bay. A confrontation between Adama and Helo is diffused by Baltar, who has discovered the abnormalities of the unborn child’s blood destroy cancer. Baltar administers a transfusion over Cottle’s objection. Roslin’s vital signs begin to improve rapidly. Following her miraculous recovery, Roslin visits Jahee in the brig, promising him a fair hearing, but only upon a promise the sabotage ends. Otherwise, she will authorize Adama to hunt the pacifists. Baltar reads Roslin’s letter. He learns she does not view the man who saved her life as compassionate. Jahee meets with the fugitive Six, carrying the nuclear warhead he obtained from Baltar. Following his near-death experience, Apollo pushes Dualla away and takes up with Shevon (Claudette Mink), a single mother and prostitute on Cloud Nine, who reminds him of “the one who got away” on Caprica. A rejuvenated Roslin meets with Adama, Baltar and Cdr. Fisk to announce a crackdown on the black market that has emerged as supplies have dwindled. Fisk is skeptical, but agrees to take the lead on the issue. Shortly thereafter, Fisk is found dead, garotted in his quarters. Adama assigns the investigation to Apollo, who finds black market loot in Fisk’s quarters, from the cigars Baltar smokes to one of Ellen Tigh’s bracelets. Apollo is nearly garotted himself in Shevon’s quarters; Phelan (Bill Duke), a black marketeer, makes clear he knows who Apollo is and doesn’t care. Roslin suggests Baltar resign as Vice-President (based partly on her memory of seeing him with Six on Caprica, though she does not mention it). The suggestion has the opposite effect on Baltar, who vows to remain in office. When Apollo regains consciousness, Shevon and her daughter are missing and the man who tried to garotte him has a bullet in his skull. Tom Zarek appears and details Fisk’s operation for Apollo (while denying involvement). Zarek also notes that Phelan handed Fisk’s killer to Apollo to close the case. Undeterred, Apollo goes to Phelan’s ship, finding the black market extends to child trafficking, including Shevon’s daughter. Apollo confronts Phelan, who makes a case for the necessity and ubiquity of the black market, including the fact that he is Shevon’s pimp. Apollo makes Phelan an offer to continue the black market, within limits excluding medicine and children. Phelan refuses, whereupon Apollo disarms one of Phelan’s goons and holds Phelan at gunpoint. Phelan believes Apollo is bluffing, but Apollo kills him and lays down the new terms to the goons. Shevon rejects Apollo’s offer to come with him, explaining that she knows she can never be the woman he truly regrets losing. Apollo sells his deal to Roslin and Adama, who tells him later in private that he knew about Shevon. Apollo observes that Dualla has gone back to Billy.